The implementation of adaptation actions in local conservation management is a new and complex task with multiple facets, influenced by factors differing from site to site. A transdisciplinary perspective is therefore required to identify and implement effective solutions. 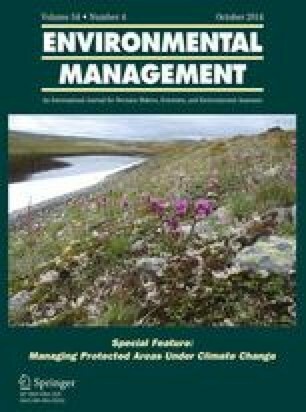 To address this, the International Conference on Managing Protected Areas under Climate Change brought together international scientists, conservation managers, and decision-makers to discuss current experiences with local adaptation of conservation management. This paper summarizes the main issues for implementing adaptation that emerged from the conference. These include a series of conclusions and recommendations on monitoring, sensitivity assessment, current and future management practices, and legal and policy aspects. A range of spatial and temporal scales must be considered in the implementation of climate-adapted management. The adaptation process must be area-specific and consider the ecosystem and the social and economic conditions within and beyond protected area boundaries. However, a strategic overview is also needed: management at each site should be informed by conservation priorities and likely impacts of climate change at regional or even wider scales. Acting across these levels will be a long and continuous process, requiring coordination with actors outside the “traditional” conservation sector. To achieve this, a range of research, communication, and policy/legal actions is required. We identify a series of important actions that need to be taken at different scales to enable managers of protected sites to adapt successfully to a changing climate. IMPACT was organized as part of the project HABIT-CHANGE—Adaptive Management of Climate-induced Changes of Habitat Diversity in Protected Areas (www.habit-change.eu). This project was implemented within the INTERREG IV B CENTRAL EUROPE Program (reference number 2CE168P3) co-financed by the European Regional Development Fund (ERDF). Additional funding was provided by the German Research Foundation (Deutsche Forschungsgemeinschaft, DFG) under the Grant number NE 1843/1-1. Our sincerest thanks go to everyone who made IMPACT such a successful event: the conference presenters who generously shared their time and expertise, the session chairs who managed their part of the event, and all the participants who contributed to lively and productive discussions. Last but by no means least, we thank all the partners of HABIT-CHANGE who cannot be named individually, as the project brought together more than 50 people from 17 institutions in eight countries across central Europe.